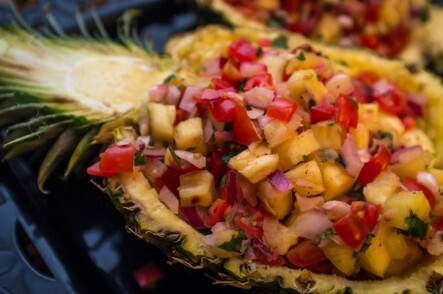 A tropical sweet, juicy pineapple is so amazingly delicious. But pineapples are more than tasty—they also come with a boon of health benefits, including improved digestion, increased immunity and cancer protection. In a study, pineapple juice was found to be protective for the heart. Pineapples are full of fiber, potassium and vitamin C, which helps to keep the heart healthy. Also, with the high amount of antioxidants, it helps to reduce inflammation, restoring healthy blood pressure. 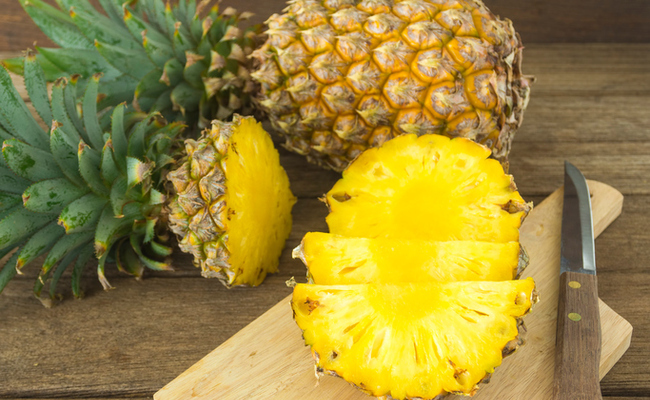 Young children diagnosed with acute sinusitis in a study were given the enzyme bromelain, obtained from pineapple, and it was found to lessen their symptoms quicker than standard therapies. Another study showed supplementing with fresh or unpasteurized frozen pineapple juice decreased inflammation of the colon. The enzyme bromelain in pineapple helps digest protein. It also helps with stomach upset and decreases the symptoms of ulcerative colitis. Fresh pineapple juices from the flesh, core and stem were used in a study which showed a suppression in ovarian and colon cancer cells. Pineapple has a high amount of vitamin C, which is well known to reduce coughs, colds and flus. Children were fed canned pineapple every day for nine weeks during a study in Manila, Philippines. The average time of infections were much shorter for the children who ate canned pineapple compared with the children who didn’t. ‘Ananas comosus’ is the scientific name for the pineapple. It is called ‘hala kahiki’ in Hawaii because they resemble the local fruit “Hana”. The name ‘pineapple’ was first recorded in 1398 to describe ‘pine cones’. Then in 1694 pine cones were first called pine cones. They were called the fruit pineapple the 1600’s by European explorers because they look like the pine cone. Historically pineapples were eaten to prevented scurvy. Also, historically pineapple juice was mixed with sand to clean boats. Pineapples take from 18 months to 2 years to grow. 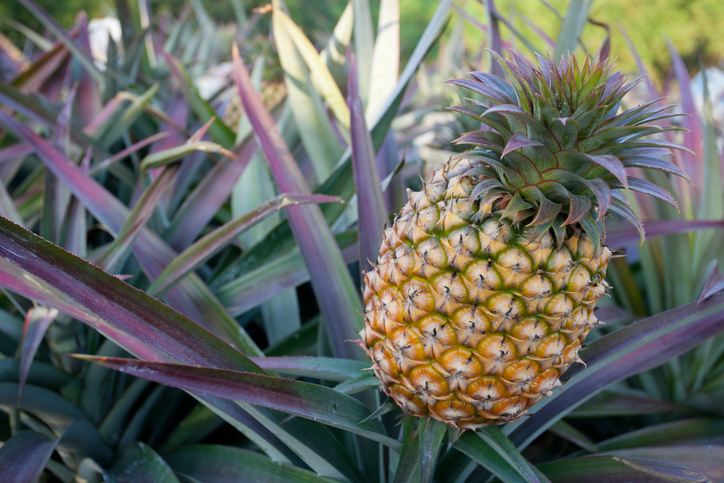 The top 5 producers of pineapples are Philippines, Thailand, Costa Rica, Indonesia and Chile. The Gold pineapple is, of course golden in color, has an extra sweet flavor and has the highest amount of vitamin C.
Pineapple can be found fresh or canned, but the bromelain is destroyed in the canned kind. When buying fresh, the ones that are heavy for their size are best. Make sure there are no soft spots, bruises and darkened ‘eyes’ on the pineapple as that means it is already past its prime. 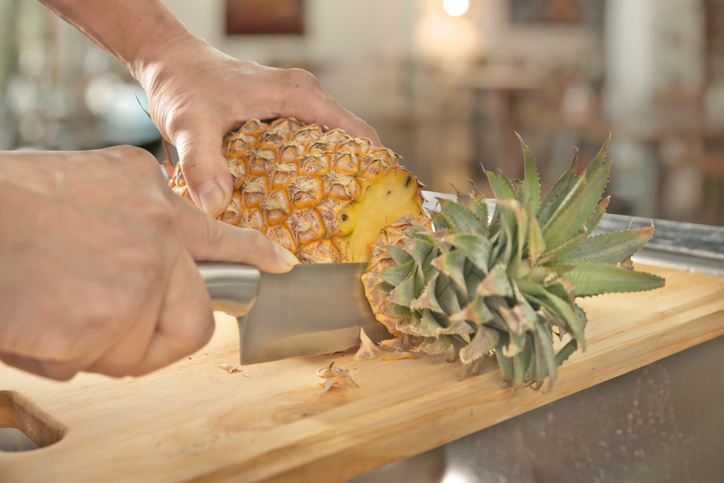 Be sure you get a ripe pineapple, because once it’s picked it will not ripen further. Find one with a fragrant sweet smell at the stem end. If it smells sour, musty or fermented, then it’s one past its due date. It is best to store a pineapple for 1 or 2 days at room temperature to let it become juicier and softer. Note: this will not make it sweeter as they don’t ripen further after picking. Keep an eye on your pineapple during this time as it can easily spoil. If you do not want to eat the pineapple after this period, then it’s best to wrap it up and store in the refrigerator for 3 to 5 days. Cut up chunks can be stored in the refrigerator for up to 7 days. You can freeze the cut up pineapple too, but the deliciousness of the pineapple gets lost. Enjoy delicious tropical powerfood pineapple with these recipes.